Yesterday started as normal with Little Miss wanting a feed at 2am. Not that I mind being awake at 2am but the process of changing feeding, burping and settling her back down takes almost an hour. I was thirsty so I took her downstairs with me whilst I raided th fridge. 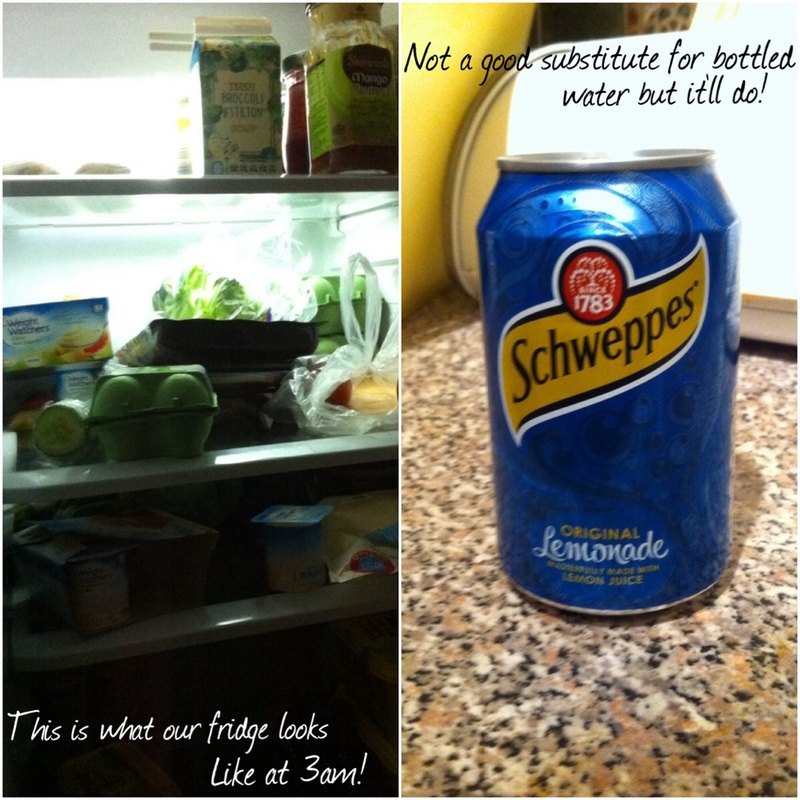 As it turns out I didn’t have any bottled water in the fridge (I’m not posh I just don’t like the tap water here) so it had to be a can of lemonade. I’ve actually been craving lemonade the past few days – must be the sugar! Little Miss slept until about 7am which was good. We got up and whilst hubby had a shower I fed and dressed her. After his shower he took care of Little Miss whilst I had a shower. Someone posted on Facebook recently, and I agree with them, but why does a bottle of conditioner not last as long as a bottle of shampoo. I use the same sized dollop of conditioner as I do shampoo but it runs out quicker! Doesn’t make sense to me! And the shampoo I use is not cheap! With the exception of this year I don’t spend much on my hair so expensive shampoo is my treat! The health visitor came to see us again. She’s nice – I like her! Especially now that I found out she’s into the F1 and is a Webber fan! Little Miss was weighed and she now weighs 9lbs 11oz and is gaining weight perfectly. 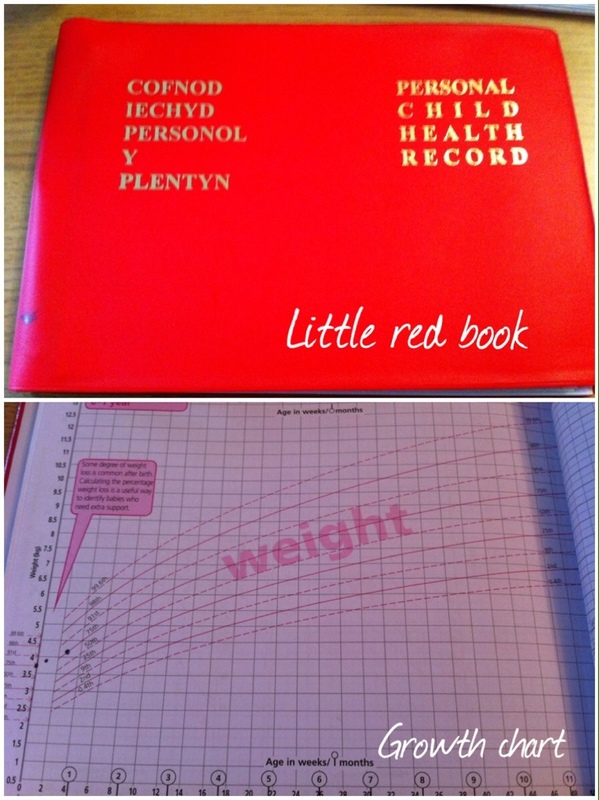 Everything was recorded on the charts in the little red book – remind me of the This Is Your Life book! 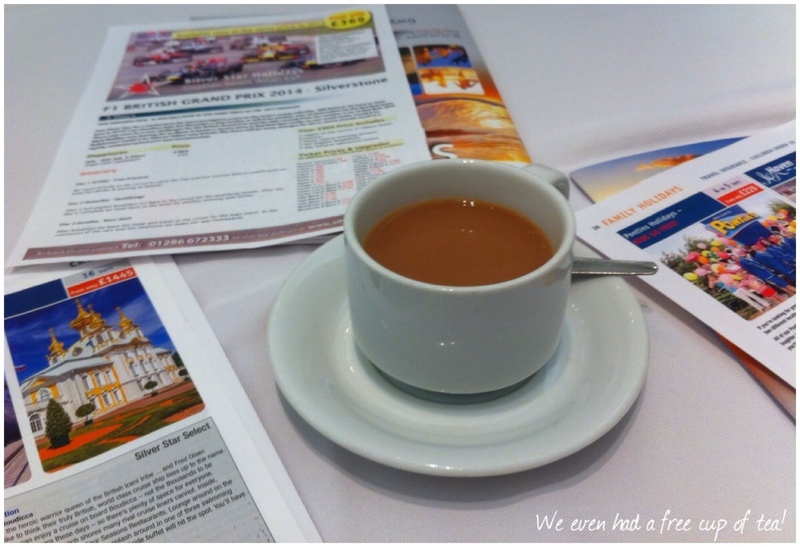 Whilst the health visitor was here I got a text message from the local travel company reminding me about their open day. My mother in law was coming over in the afternoon so I texted her to see if she wanted to go. Mother in law came over and we had a spot of lunch before heading down to the open day. I’ve travelled with the company before (to the Belgian GP) and I’m looking to go with the to a Silverstone this year. 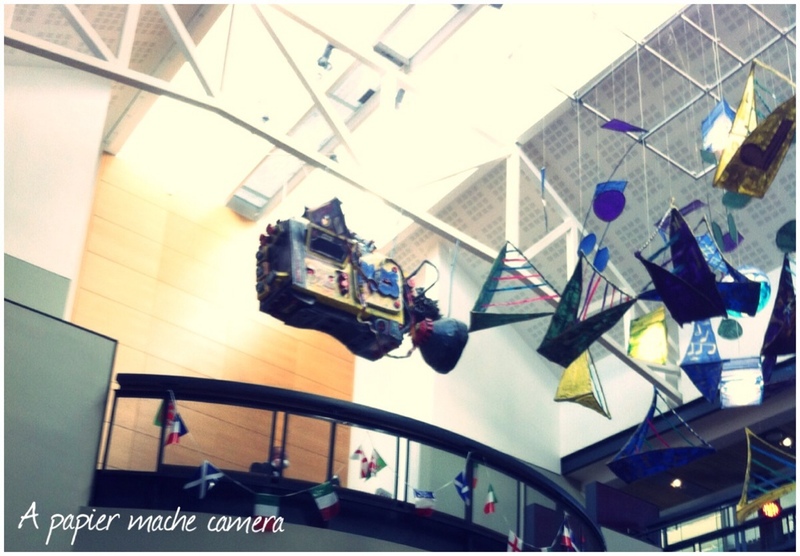 I’ve been to one of their open days before and got some money off so I was hoping for something similar again! I managed to wangle £15 off each which isn’t much but every penny helps! I didn’t book the trip yet as I needed to speak to the hubby. On the way out I saw this hanging above the bar which I thought was interesting! 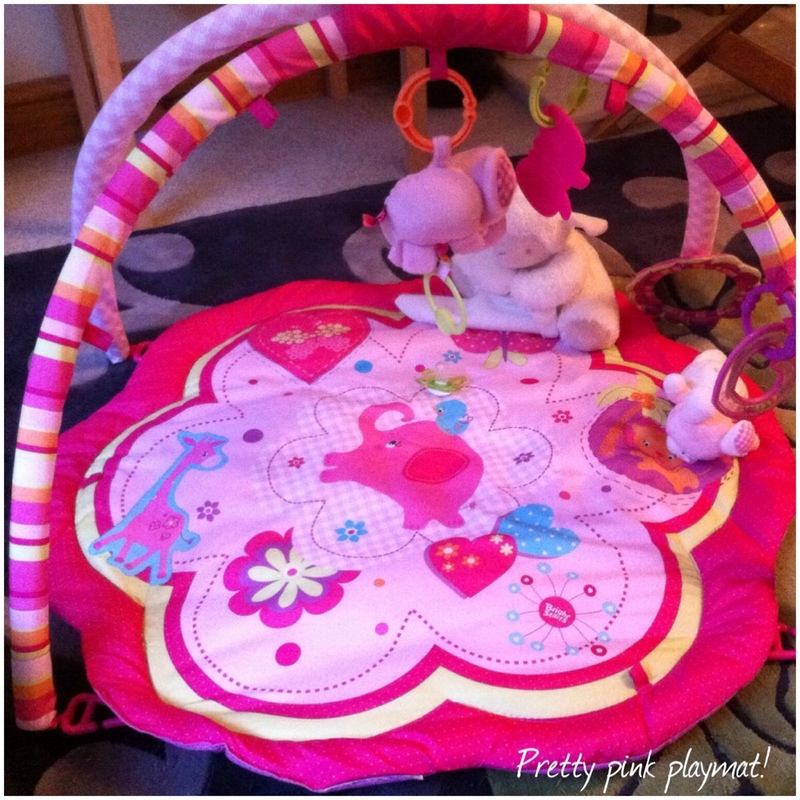 Little Miss was awake for a while after we got home so I put her down on her playmat. She’s too small to do much at the moment but the elephant in the middle plays some “plinky plonky” music which she seems to like. The playmat was a gift from my Dad. Hubby came home from work and proceeded to make gammon, chips and beans for supper. 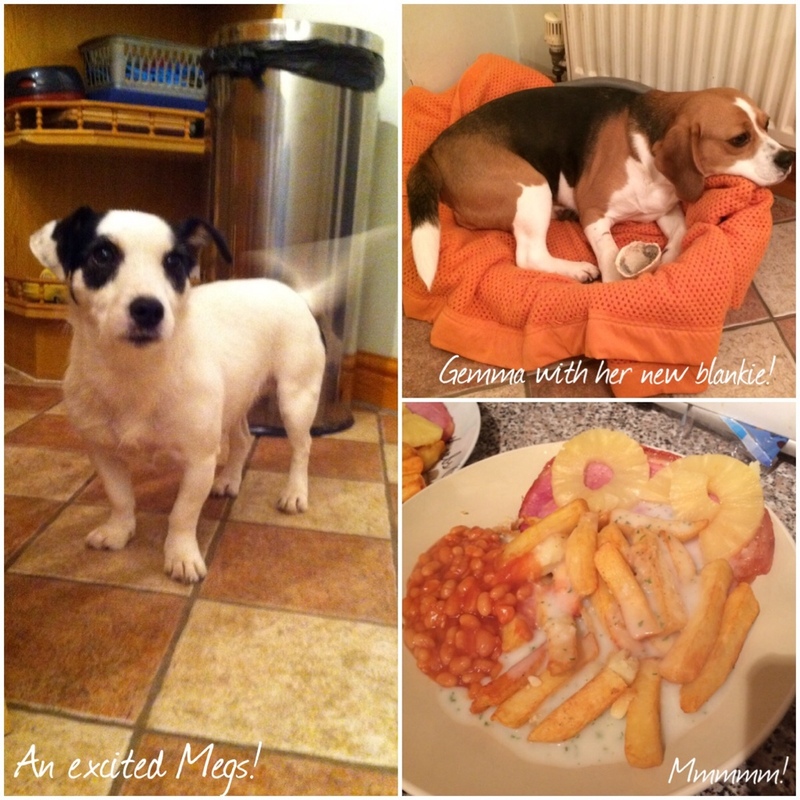 Whilst he was making food and whilst Little Miss was quiet I played with Megs and Gemma for a bit. As you can see from the photo Megs was very excited! Gemma was being a “pwdu-chop” in her basket. I think she was just too comfy on her new orange blanket. The rest of the evening was spent watching today’s television – Neighbours, Pointless and Homes Under The Hammer. 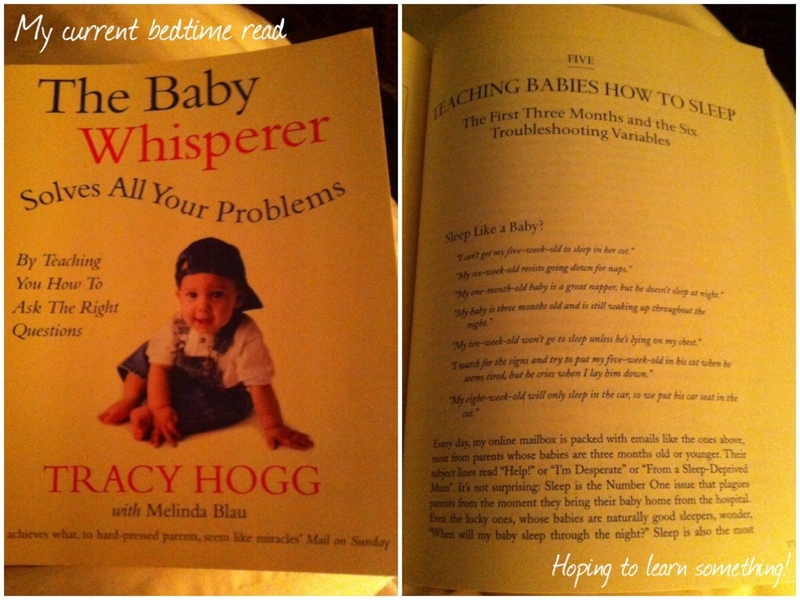 We went to bed around 9.30pm and after settling Little Miss down to sleep I started reading the book The Baby Whisperer because when I google problems with Little Miss a lot of advice seems to come from this book. The book was given to us as a Christmas present from hubby’s aunt. I haven’t read much of it yet but hopefully I’ll pick up some tricks on how to settle Little Miss. That was pretty much it for yesterday – my days are filled with feeding, changing and settling Little Miss! I know she’ll grow up soon enough and I’ll be looking back thinking where have these days gone but I am looking forward to when she’s older and she can tell me what’s wrong! As for the conditioner, I know how that feels! I have no idea why my conditioner always runs out first. At least it leaves my hair smelling nice… can’t complain (I washed my hair yesterday!). I don’t remember my parents having a book when I was young. They probably did but I’ve never seen it. I try to wash my hair every other day but I normally end up doing it daily when I was at work. I’ve not read too much of the book yet but the first goal is to get rid of the 2am feed! So here’s hoping!! Hi. I came via Manda’s link-up and hell yes! I have the Tresemme and I used all my shampoo before my conditioner too. Grr. Maybe it’s because conditioner’s are thicker? I have no idea. o_o? I think we’ll just have to accept that it’s a fact of life. Conditioner never lasts as long as shampoo! My sister’s going to Silverstone this year! She’s a massive F1 fan, but she likes Hamilton and Button. I rarely use conditioner, yo I can’t help with why it runs out quicker. 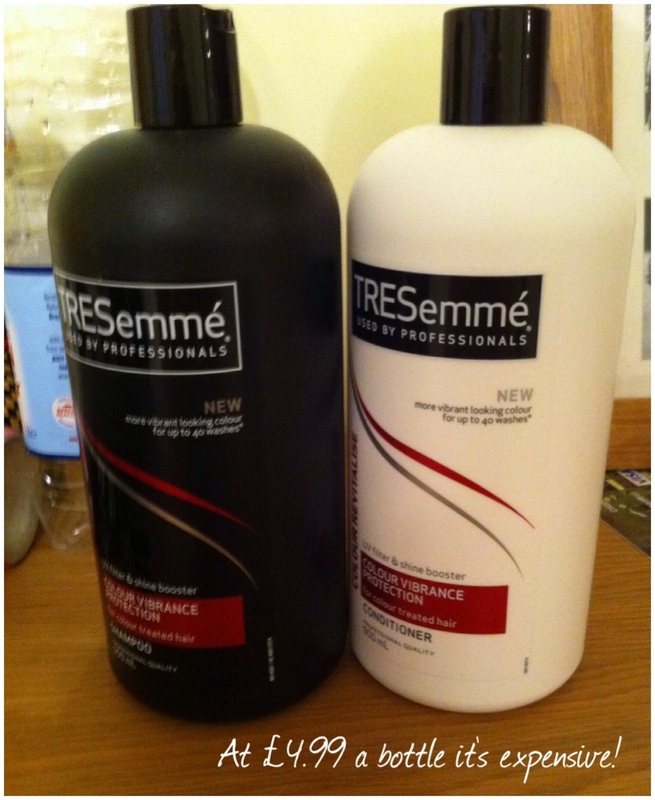 TRESemme products are really expensive though!! Oh I like them as well! I’m undecided on who I’m supporting this year. Probably Ricciardo as I can still wear my Red Bull gear! Also supporting Alonso. products. So it’s my treat! Urgh can’t stand fizzy water either. I’m not against drinking tap water except its horrid here! It’s a pain isn’t it! I have to buy twice as much conditioner! Well I definetly needed a nap after friday! Thankfully saturday was a bit more of a chill out day! I’m not quite sure how I do it either to be honest! I ALWAYS use up shampoo faster than conditioner too! Sometimes I won’t use conditioner, though, and will use a hair mask or deep conditioning… er, conditioner, which is why I use it up first. I still used it up first before I used hair treatments though, so who knows what’s going on with that! I always have to use conditioner otherwise I can’t get a brush through my hair! !